Celebrate Law Week with the Commissioner for Senior Victorians Gerard Mansour. 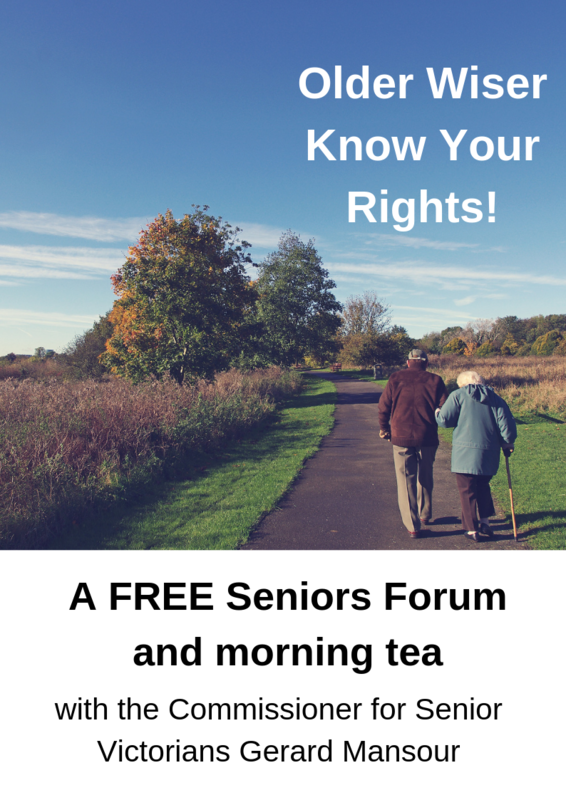 Older Wiser Know Your Rights is a free forum and morning tea for seniors featuring a presentation from Seniors Rights Victoria and discussions with local experts. We all want to be treated with respect, no matter what stage we are in life. This may sometimes get forgotten with the day to day pressures faced by both individuals and families. In this interactive forum, you will earn about how to protect your rights and prevent elder abuse as you age through interactive discussions from local experts and a short film screening. Presented by Barwon Community Legal Service and the Barwon Elder Abuse Primary Prevention Network . Contact Alexandria Jones from Barwon Community Legal Service.